Jesus invites us to make a difficult and sometimes stormy passage of faith from the enthusiasm of discipleship to the gentleness and humility of friendship. Friendship with Jesus – the Word made flesh – becomes the nourishment for our hearts and lives. Jesus is not only the Word of God – fully transcendent, enlightening our minds and intellects. Jesus is also the Word made flesh. God incarnate for us. God wanting to give himself to us as He is. God wants our friendship, our kinship, and through the incarnation of Christ reveals that He is willing to become so vulnerable and so very ordinary in his flesh in order to achieve this. In many ways this is the scandal of the particular and the ordinary. It is what the people murmur about in this Sunday’s gospel (Jn. 6:41-51) and the same murmuring continues today. After Jesus says, I am the bread that came down from heaven; we find the people saying, Is this not Jesus, the son of Joseph? Do we not know his father and his mother? In other words, we know this man, how can he say such things? Why would the omnipresent and all-powerful God reveal himself in a particular and seemingly ordinary person, in a particular place and in a particular time? The murmuring continues today in a variety of forms. “I am spiritual but not religious.” “My God is bigger than your dogma.” “The Eucharist is not really that important.” This murmuring demonstrates an approach to faith that is happy to keep things open and generic and also one that easily congratulates itself on being “enlightened”. But, it also should be noted that it is an approach that keeps any real demands on me at a minimum. A truly open and generic God will not make particular demands on my life, my time and my desires. The quote by Jean Vanier also highlights another aspect of the scandal of the particular. It is rooted in fear. The fear of having to make that truly necessary but stormy passage of faith from the enthusiasm of discipleship to the gentleness and humility of friendship. The truth is that there is a part within each of us that prefers discipleship to friendship. Discipleship is quite respectable and yet it still keeps God and Christ a bit removed. Christ is the master and we are the disciples and although this is always true the Gospel today should shock us, it ought to shock us, into the recognition that this is not enough for God. Jesus says, It is written in the prophets: ‘They shall all be taught by God.’ … I am the bread of life. Your ancestors ate the manna in the desert, but they died; this is the bread that comes down from heaven so that one may eat it and not die. I am the living bread that came down from heaven; whoever eats this bread will life forever; and the bread that I will give is my flesh for the life of the world. In the very ordinary stuff of bread and wine Christ has chosen to give us his very self – full divinity and full humanity! The infinite chooses the finite to reveal himself. The very particularity of Jesus himself and the very particularity and ordinariness of the Eucharist reveals to us that before God is ever an incomprehensible mystery for our reason and intellect to ponder, He is an unfathomable mystery of love to receive. God has chosen to give Himself for us. God wants the gentleness and humility of friendship. We do not need superhuman effort in order to understand something of heaven nor do we need extraordinary mediators to communicate with God. God is here. God is present. 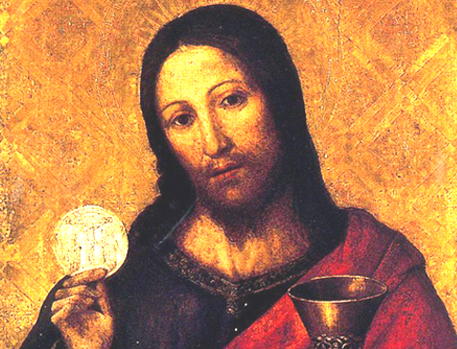 Christ gives himself in the Eucharist. All that we have to do is receive. As we approach the altar we should be aware of what we are about and what God is about. We should neither do this half-heartedly nor half-mindedly. We should be aware that in the Eucharist Christ wants and invites us to undertake that stormy passage of faith from the enthusiasm of discipleship to the gentleness and humility of friendship. And as we undertake this, we come to realize in the very particular and concrete way of our own life that friendship with Jesus – the Word made flesh – truly becomes the nourishment for our hearts and lives.